"This is one of the nicest rooms in Chicago. The decor, the sound and staff are really top-notch!" "Unmasking the Face the Homelessness"
You are cordially invited to our 4th annual Lazarus House Gala & Benefit. Please join us and enjoy the "Music of the Night." Mingle with friends, bid on silent auction or purchase a mystery bottle of wine. Enjoy a delicious plated dinner, sweets, a heartwarming presentation and an exciting live auction! And that's not all, Rat Pack Jazz with authentic retro style vocalist Frank Lamphere will perform immediately following the program. So put your dancing shoes on and join us for an evening of helping your neighbors in need! Frank and trio performing a concert on October 02, 2016 at Our Lady of Mercy Catholic Church in Aurora. Lamphere and his trio performing "A Foggy Day" in May 2016. Frank performed on the field at US Cellular Field on May 06, 2016. The Chicago White Sox hired Lamphere as a part of their Italian Heritage promotional event. Frank along with his trio of pianist Bobby Schiff, bassist Mark Sonksen and drummer George Fludas performed at the Hearts and Shamrocks fest in Cicero on March 02. Frank unveiled his new show "Back in the 60s" on Febrauary 23. The show was a great success. The trio consisted of pianist Bobby Schiff, bassist Mark Sonksen and drummer Phil Gratteau. June 29, 2015 Frank enjoyed singing with Jeff Lindberg's Chicago Jazz Orchestra at Andy's Jazz Club on Monday June 22. 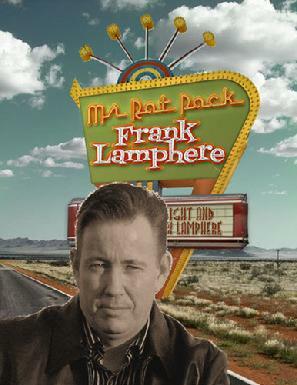 Lamphere performed nine songs over the two sets including his own personally commissioned swinging chart of the Dean Martin hit "Everybody Loves Somebody"
Frank is delighted to have been hired to perform with his trio, at the VIP Dinner for the EDM Biz Conference in Las Vegas. The show will take place at the Cosmopolitan Hotel and Casino on June 17. 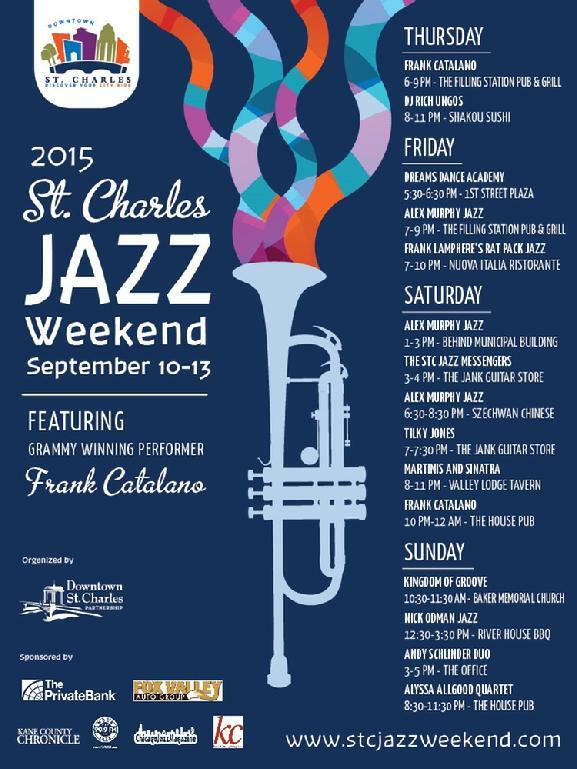 Chicago pianist Jeremy Kahn will be Frank's accompanist. Drummer Mike Mechem and bassist Danny DeMorales both from Las Vegas will complete the trio. (In the video clip below) This trio performing at Luigi's. Performed with a handpicked, allstar band. accompanied by his six piece band on the Rosebud stage. The date is Friday, August 15 7-10pm. 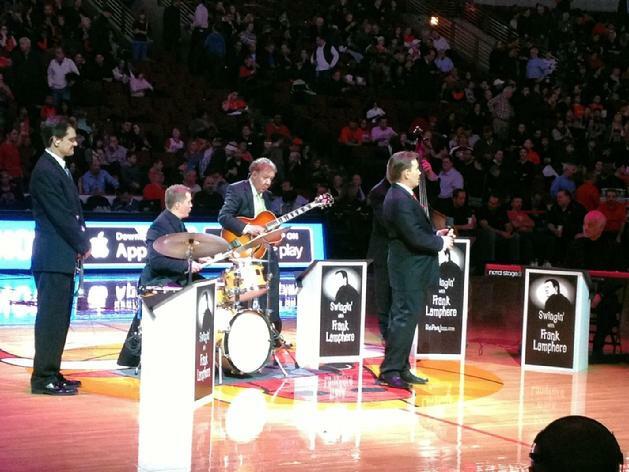 FEBRUARY 06, 2014 Frank and his Rat Pack Jazz Sextet will be performing at the half-time of the Chicago Bulls-Brooklyn Nets game on Feb 13. The nationally televised game (TNT) will start at 7PM Central time. 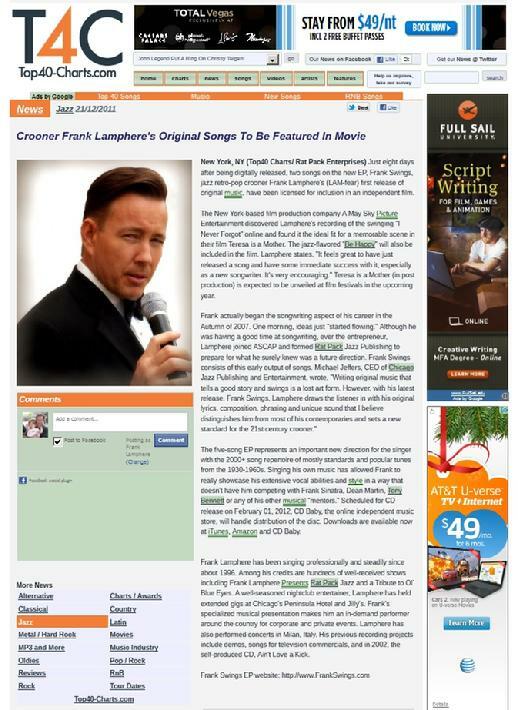 Frank put together a special medley of songs for the performance, that celebrate Valentine's Day. 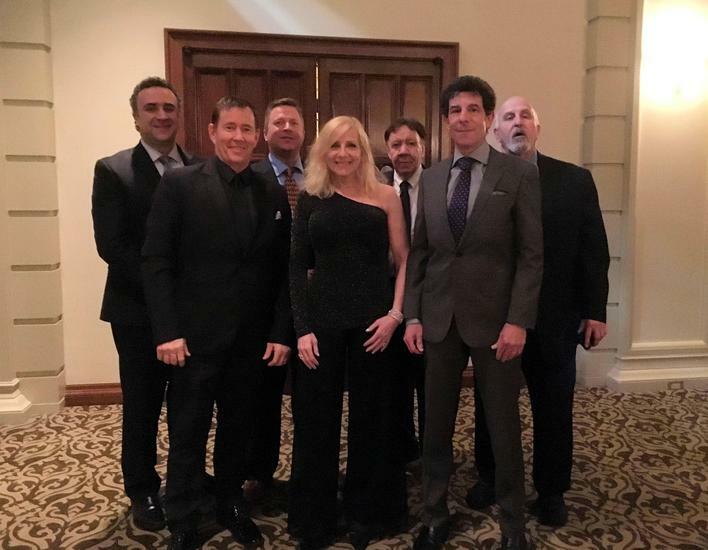 November 17, 2013 Lamphere performed for the Little City annual gala last night (11-16). The event took place at the Hyatt Regency Chicago. Frank's trio of Jim Ryan, Mark Sonksen and Bill Klewitz played during the cocktail hour. Dinner was served and there were numerous speakers before the music resumed. After dinner the original trio became an eight piece band with the addition of drummer George Fludas, Jerry DiMusio on tenor sax, Danny Barber on trumpet, vocalist Laury Shelley and of course Frank.